Enjoy "a night celebrating the LGBTQ community" at "Candide" at the LA Opera. 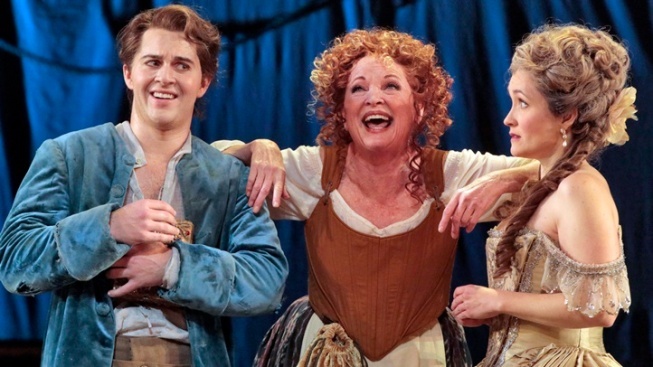 Jack Swanson as Candide, Christine Ebersole as the Old Lady, and Erin Morley as Cunegonde in LA Opera's 2018 production of "Candide." A Night OUT at the Opera: "Candide" is one of the most philosophical, spirited, and puckish of tales, and that it has landed in wintertime at the LA Opera, and stars comedy greats Kelsey Grammer and Christine Ebersole, further ups the air of introspection and merriment. Equality California is presenting a special evening at the Dorothy Chandler Pavilion on Thursday, Feb. 8, all to honor the LGBTQ community. There's a money-saving promo code here, and an after-party with gratis vino, bites, and more performances, hooray. Details? Find them here. Carrot Cake Fundraiser: How did you celebrate National Carrot Cake Day, which happened on Feb. 3, as it does each year? If you didn't get a chance to indulge in the nicely spiced cream-cheesy confection, there's time to do so, while also giving support to No Kid Hungry. For Ocean Prime Beverly Hills will donate a dollar from every carrot cake slice sold to the organization, from through Friday, Feb. 9. This is the eatery's Ten Layer Carrot Cake, if you've had it before, and if you haven't, make a date, before Feb. 9, to stop in, order a piece, and help No Kid Hungry. Motion Picture Costume Design Exhibit Opens: 'Tis the celluloid-iest season of the year, when major award shows flower, and the Fashion Institute of Design & Merchandising will once again host one of the most spectacular sartorial presentations around. See several dozens costumes from popular and Oscar-nominated films at the FIDM gallery every Tuesday through Saturday from Feb. 6 through April 7, 2018. It's all free to see, too. On the 2018 line-up? "Wonder Woman," "Phantom Thread," and "Dunkirk." Pints for Paws: Ever patio'd it up with your pooch at Golden Road Brewing? If you haven't yet, here's a prime evening to do so (and temperatures are expected to be more summery than wintry). It's a foodful and foamy fundraiser for the Pasadena Humane Society & SPCA, so order vittles, and your suds, and don't forget to tell your server you want to support the Pasadena Humane Society. After that? Fifteen percent of your bill will be donated to the animal-centered organization. The date is Thursday, Feb. 8 and the hours are 6 to 9 o'clock. LUZIA's Final Week in LA: Haven't yet caught the celebrated Cirque du Soleil show at Dodger Stadium, the one that revels in "a waking dream of Mexico" with flair and poetry and amazing athleticism? There's still time to admire the acrobatics, the balance, the dance, the clowning, the costumes, the make-up, and the strong sense of mystery that pervades it all. The final date in Los Angeles is Sunday, Feb. 11, but hurrah: The show is cartwheeling into Costa Mesa for a month-long run on Wednesday, Feb. 21.